I only went to the AXDW on Days 1 and 3, but I had a great time and it gave me the chance to meet some new people and catch up with others that I hadn’t seen in a while. Outfit-wise I went for mostly blacks on both occasions. I guess my work dress code is starting to influence my whole wardrobe (I work for MAC and the dress code is “all black”!). But you can never go wrong with black, can you?! My make up is of course all MAC, but I honestly can't remember what eyeshadows and lipstick I wore in the first outfit. In the second, I used Print and Carbon eyeshadows lightly blended to create a soft smokey eye, and Impassioned lipstick with Boldly bare lip liner. It was a celebrity parade alright! But surely not only that. 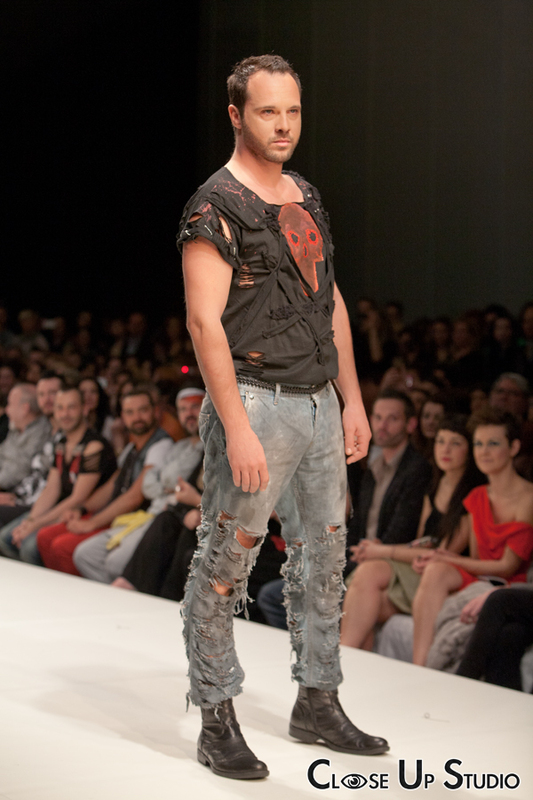 I think Dimitris Strepkos and Eleni Mparla (the names behind Celebrity Skin), really raise the bar! They showed an excellent collection, with unique pieces, that are so avant garde, yet wearable (in an eccentric but stylish way). I loved the turbans and the arty eyewear and all the shoulder or head pieces that added to the theatrical presentation. It was mostly blacks, with lace and leather and puffy shoulders and lots of skulls (especially in the men’s line). 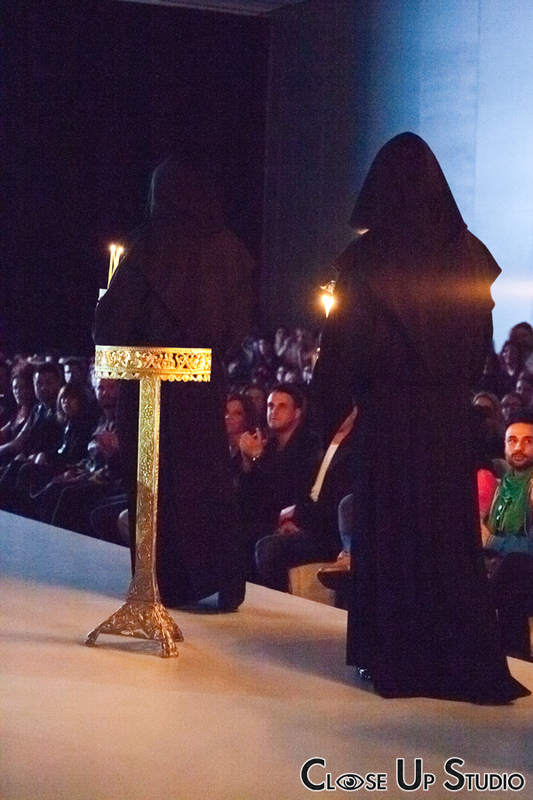 The minute I saw the ecclesiastical candleholders on the runway I thought that we’re about to see something very intriguing. I couldn’t be more right. The lights went down and on the video wall a clip was playing, preparing us for what we were about to see, creating a very mystical atmosphere. And then, psalms were heard and men appeared dressed in black cloaks, holding lit candles that they placed in the candleholders. After that, the models started walking down the runway, showing the designer’s beautiful creations. The color palette consisted of blacks and silvers with a hint of blue and beige. 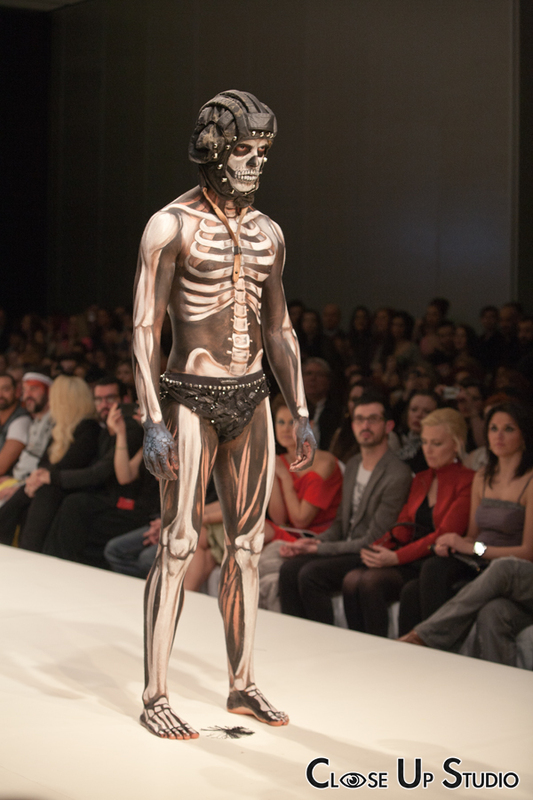 The jewelry/art pieces were by Perikles Kondylatos, and they made quite a statement! I must say that this was the most impressive show (at least among the ones I saw) and kudos to Ourania Kay and her team for the idea and the amazing presentation! 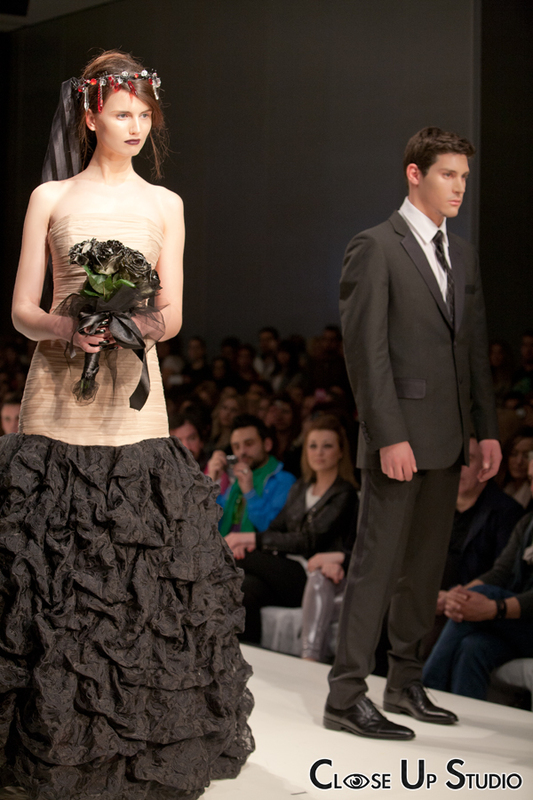 On the first day of AXDW, Stephan Caras presented his collection for AW 2012-13, titled “Lush Sensuality”. The title describes perfectly what we saw at the show. Feminine and sensual shapes, made by lush materials such as brocade, fur, organza, and feather ornaments. Stephan Caras is said to be “the designer who loves women” and that appears to be rightfully true. The figure hugging dresses and trousers and the see-through blouses and lush details would make a woman feel a million dollars! P.S. Yvonne Bosnjak and Ana Dimitrijevic also walked down the runway and they both looked gorgeous! 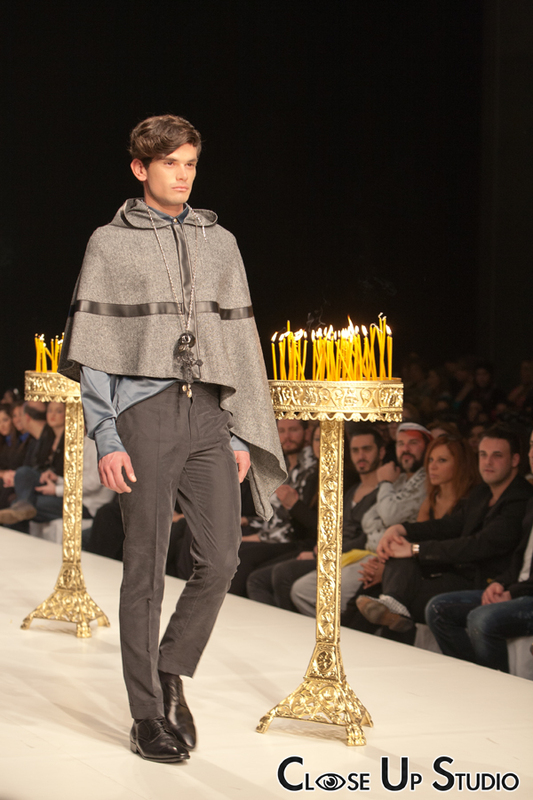 Stelios Koudounaris showcased his new collection for Fall/Winter 2012-13 this Saturday night. We saw a mixture of textures, all beautifully layered to create liquid silhouettes. He remained consistent to his usual greys and blacks, but this time there were also some burgundy-reds and muted golds. I loved quite a few of those muted golds as well as the see through details and the different lengths all blended together, following the shape of the body. The men’s line was also very appealing, especially the textured knits and the jackets. What I most like and admire in Stelios’ creations is that they are instantly recognizable. 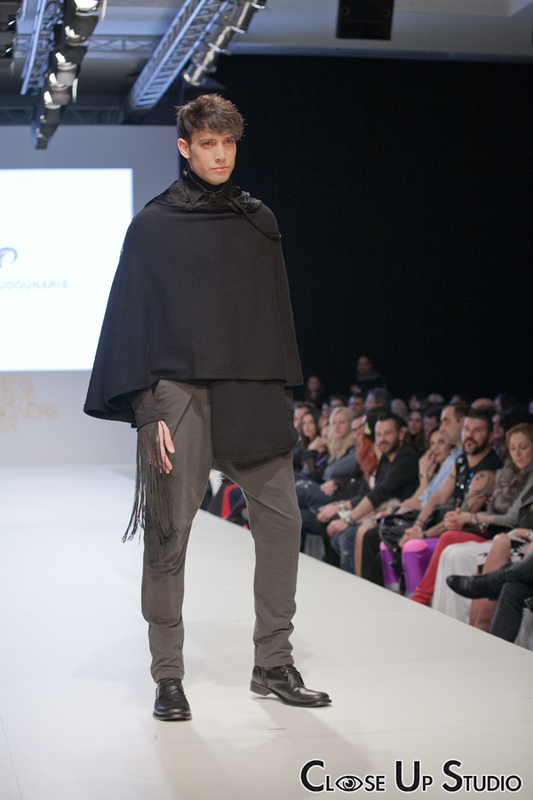 He has a specific style and identity that he remains faithful to and that’s a very important element for a designer. Without repeating himself, he manages to evolve and present something new every time, that still is utterly and totally “Stelios Koudounaris”! Last but not least, the amazing shoes were Jeffrey Cambell and the fringed accessories by Anna K.
Hello my lovelies, how have you been? I know I haven’t updated this blog for a while, and I also have missed several fashion events (mostly due to work), so I didn’t feel that I had much to blog about. Maybe I could start making some outfit posts again, but the cold and rainy weather we’ve been having lately, just puts me off! So the thought crossed my mind that I could blog about a photoshoot we did last month. Most of you know that my brother is a professional photographer and that we usually work together in photoshoots (and of course he’s the official photographer for this blog!). We had the chance to work with Katerina Evangelinou, a former Miss Hellas, who is a model and a TV presenter. The object of the photoshoot was jewelry, made by Valia de Grèce. The photoshoot took place at Close Up Studio (my brother’s studio) and we had so much fun during it. I really enjoyed working with Valia and Katerina! Below are some of the photos from the photoshoot and don’t forget to visit Valia’s site to check out her amazing jewelry. You can buy online and the shipping is international! 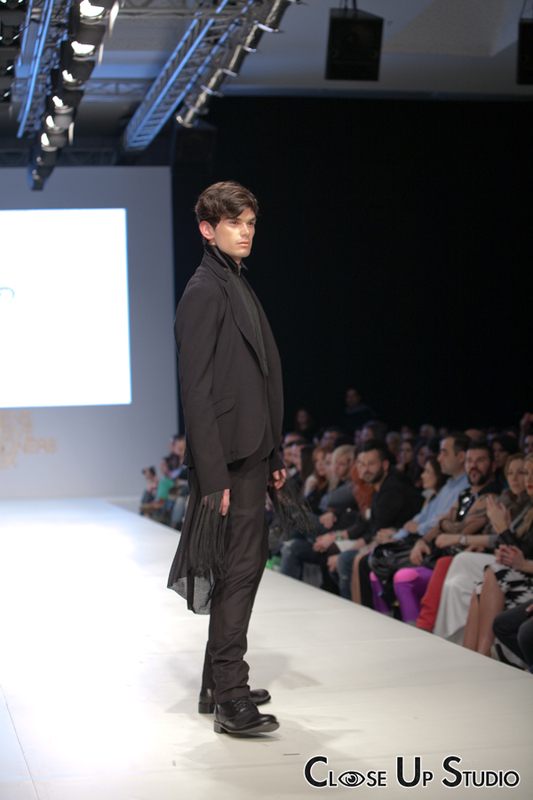 PS: The clothing used for the photoshoot was from the Raxevsky spring-summer 2012 collection.